Single phase industrial vacuum cleaner for Wet&Dry cleanroom applications. 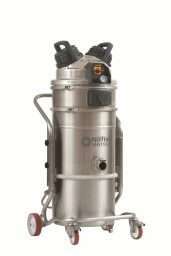 The GMP design and the stainless steel build make it extremely easy to clean and sanitize. The ULPA15 downstream filter installed on all the CR machines avoids contamination of the cleanroom area by the unit. Optional upstream HEPA14 or ULPA15 filter secure the highest filtration efficiency in case of very fine dust. The innovative PullClean system allows effective cleaning of the M Class star filter while the vacuum is running. Optional mechanical floater to stop the vacuum when the maximum level of liquid is reached. Upstream HEPA14/ULPA15 filter for fine dust. 37L stainless steel removable container. Optional Stainless steel AISI316L execution for the container and the filter chamber. Vacuum meter to detect status of the filters.